When John Coltrane's Ascension was released in 1966, jazz critic Bill Mathieu from Downbeat wrote "This is possibly the most powerful human sound ever recorded", an apt description of Coltrane's free jazz masterpiece. My Penguin Guide To Jazz says "If Coltrane had never recorded another note of music, he would be guaranteed greatness on the strength of Ascension alone". My Oxford Companion To Jazz calls it "one of his most awesome, daunting, recordings". Dave Liebman called it "the torch that lit the free jazz thing". It was a fourty minute long group improvisation with two trumpets (Freddie Hubbard and Dewey Johson), two altos (Marion Brown and John Tchicai), three tenors (Coltrane, Archie Shepp and Pharoah Sanders), two basses (Art Davis and Jimmy Garrison), one piano (McCoy Tyner) and one drums (Elvin Jones). This band of jazz icons improvises as a group around changing sound structures, alternated by solos of the band members, in this way shifting between sonic density and lightness, between rhythmic and a-rhythmic passages, playing with dissonance and harmony, resulting in music that sounds like rolling waves of sound full of musical power and relentless emotional weight. If you don't have it yet, run to the store now! So why cover this masterpiece? Who has the audacity to think that it can be improved? Who has the arrogance to pretend people are waiting to hear a new version of it? I never understood why anyone would dare cover what is already sublime, a clear strategy for failure as the new version's mediocrity can only be obvious to anyone familiar with the original. But then it does happen! Already in 1995, to celebrate the 30th anniversary of the piece, Rova took its first take on Coltrane's Ascension, and it took till 2005 for it to be released as a really strong album that does not try to emulate the orginal, but rather uses it and gives it a different direction without relinquishing what makes the original powerful (ROVA::Orkestrova - Electric Ascension (Atavistic, 2005). Rova has played Ascension at various festivals and concerts in the past decades, with changing band members, but with pretty much the same instruments : four saxes, two violins, trumpet, electric guitar, bass guitar, drums and electronics, indeed, something else entirely than the original line-up of Coltrane's band. Now, fifty years after Coltrane's original release, we get what we can already call one of the must-haves of the year, a musical event that will be hard to match, not only because of the music, but because of the total package : a CD, a Blue Ray and a DVD for what is called : "a 21st century reimagining and arrangement" of Coltrane's masterpiece. And I can tell you that you will love the total package. The music itself was performed at the Guelph Jazz Festival in 2012, with the following band members : Bruce Ackley on soprano saxophone, Larry Ochs on tenor saxophone, Steve Adams on alto saxophone, Jon Raskin on baritone saxophone, Chris Brown and Ikue Mori on electronics, Hamid Drake on drums, Carla Kihlstedt and Jenny Scheinman on violin, Nels Cline on electric guitar, Fred Frith on electric bass, and Rob Mazurek on cornet. They start with electronics to set the scene of today's sound, and then the whole band joins with the grand theme of the composition, followed by improvisation around it by all musicians together, a sonic firework of flowering notes that weave in and out of the theme based on hand signals by Jon Raskin ... and then the solos erupt out of the theme, mostly for duets or trios, sometimes highly energetic with fast-speed reactions to each other, sometimes in chamber music simplicity and calm, sometimes ferocious and wild, sometimes solemn and spiritual, sometimes with crackling electronic soundscapes, yet always full of purpose and focus for more than sixty minutes of musical delight, every so often falling back on grand joint harmonies which unravel again in new musical vistas in a wonderful eb-and-flow between collective interplay and intimate interaction between two or three individuals. This is no longer Coltrane, this is something else entirely, but in the spirit of the master, a modern piece of art that can stand on its own. Needless to say that all musicians are excellent and fully comfortable with the material, and if any names have to be mentioned then Carla Kihlstedt and Jenny Scheinman are worth highlighting because of their contribution to the overall sound, and their surprisingly free improvisations are exceptional (meaning I have never heard them perform in such a free context). You get the performance on CD, obviously. On the Blue Ray, you get the entire concert in wonderful visual broadcast quality, filmed with more than a handful of cameras, with a director who knows what and who needs to filmed when, which is usually one of the shortcomings of concert videos. 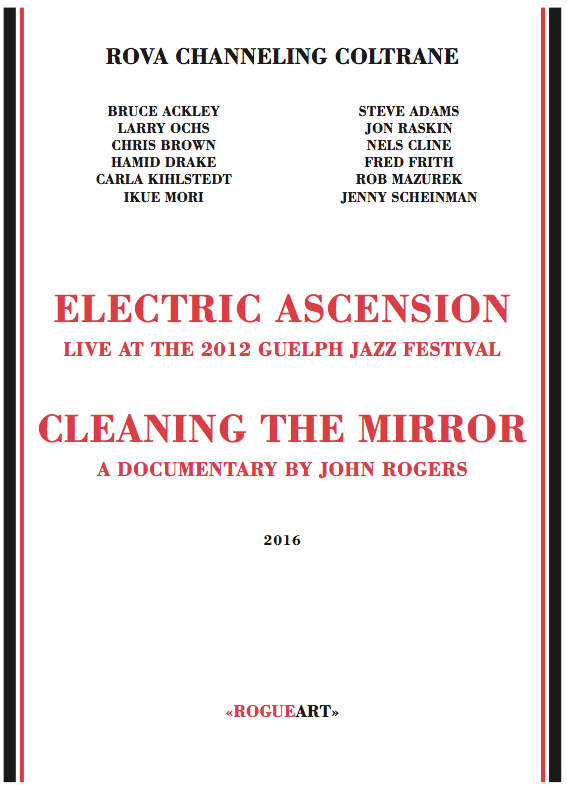 The DVD offers both the concert and "Cleaning The Mirror", a documentary by John Rogers on the concept of Electric Ascension, including insightful interviews with some of the fifty musicians who have performed the piece so far : Jon Raskin, Larry Ochs, Nels Cline, Andrew Cyrille, Art Davis, Jason Kao Hwang, Eyvind Kang, Rova, Jenny Scheinman, and Elliot Sharp. The documentary offers musical excerpts, archival photos, and behind the scenes footage. For those interested : the band will perform Electric Ascension today at the NYC Winter Jazzfest. And the previous two ROVA recordings of Ascension are well worth a listen: John Coltrane's Ascension - Rova's 1995 Live Recording (Black Saint, 1996) and Electric Ascension (Atavistic, 2005). In my view, ‘Ascension’ is not so much a composition which can be covered, as an open form blueprint for reinvention (ensemble – solo(s), ensemble – solo(s) – ensemble – solo(s), etc.). It might be for this reason as much as Coltrane’s presence and the density of the ensemble passages, which accounts for so many free jazz musicians citing it as an influential work. Certainly, you can imagine a series of versions, such as those by the ROVAs plus others, in a way one couldn’t with ‘A Love Supreme’. Hi Colin, thanks for the 'Black Saint' issue, of which I wasn't aware. And I agree with your comment on Ascension as a blueprint, which allows it to be "covered' as it is here by Rova.